I am having trouble signing into the Web Pharmacy. What should I do? If you have used the Web Pharmacy in the past, please sign in with your username first, not your email address. You’ll have the opportunity to change this to your email address once you sign in. If you’re still having trouble, email us at tomthumbsupport@mscripts.com. If you have forgotten your password, go to this link https://tomthumb.medrefill.com/ttweb/#/forgotPassword and just enter your email address. We will send you an email with a link that you can use to reset your password. Alternatively, you can also use the ‘Forgot password?’ option on the sign in page of the webpage. If you have forgotten your email address, please contact our technical support at tomthumbsupport@mscripts.com. We may have just upgraded your web page, in which case, you’ll need to go through a one-time process to update your account. Please enter your username and we’ll send you a link to a web page to create a new password. You can do one of two things. Either contact our customer support team at tomthumbsupport@mscripts.com for assistance. Or, if you’d prefer, you can simply create a new account. 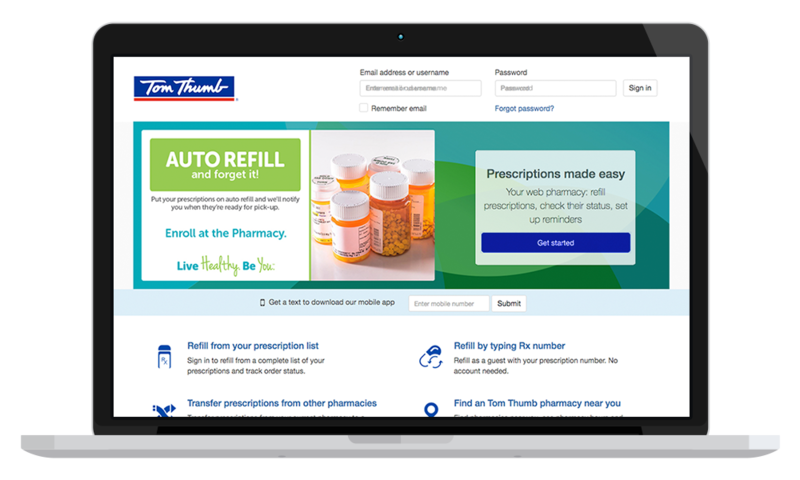 What kind of browser do I need to use the Tom Thumb Web Pharmacy? Our Web Pharmacy should work on almost all modern day browsers like Google Chrome, Safari, Firefox, Microsoft Edge etc. If you are having trouble getting it to work, please make sure your browser is updated to the latest version or try an alternate browser. Can I use the Web Pharmacy on my mobile device? Yes, our Web Pharmacy is a responsive, which means that it works on desktops, tablets and mobile phones. Can I manage my prescriptions for my family using the Web Pharmacy? Yes, our Web Pharmacy lets you manage prescriptions for your family and loved ones. To add a family member, simply sign in and select the "Family care" option from the main menu. What prescriptions can I refill using the Web Pharmacy? While nearly all prescriptions can be filled through the Web Pharmacy, there are a few that cannot due to various state regulations. If you try to refill one of these prescriptions, the Web Pharmacy will inform you that it cannot be refilled. If you have any questions about these prescriptions, please contact the pharmacy. Yes, you can. You can sign in to the Web Pharmacy and go to the "Reminders" option on the menu to set up reminders to take medications. Please sign in to the mobile app or the Web Pharmacy and go to 'Reminders'. Go to the 'Settings' section. You can simply reply with 'P' to any of our text messages from your registered mobile number to receive a link to manage your preferences. To manage the timing and frequency of your notifications, go to the Reminders option on web page. The Web Pharmacy goes beyond the text experience and provides you with more functionality and control. With the Web Pharmacy, you can order refills from a list, view Rx history, manage reminders and much more. My Prescriptions displays the list of all your medications along with prescription number, dosage, quantity, fills left and expiration. You can refill directly from your prescription list. You can refill your prescriptions without logging into the app by typing in your prescription information. You can easily transfer prescriptions from other pharmacies outside Tom Thumb to a Tom Thumb pharmacy. Pharmacy Locator allows you to easily find a pharmacy. The feature includes: get directions, pharmacy hours, contact information (with click-to-call functionality), and service offerings (clinics, flu shot, and more). My Doctors allows you to organize your doctor/patient relationship. You can see your Healthcare provider's contact information and call or fax the doctor directly. Within My Account, you can easily set up reminders (via text, push or email) manage your notification preferences, and more.